Patio doors have one main purpose: to seamlessly connect indoor and outdoor spaces in your home. There are different choices available for you to consider so there’s sure to be one that will suit your home best. 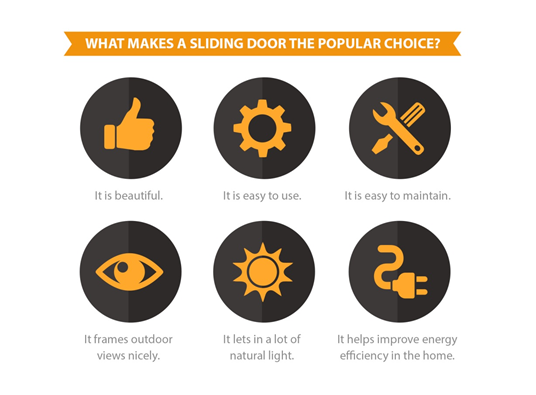 If you’re looking at sliding patio doors, read on to learn more about their many advantages. Why Get a Sliding Patio Door? ● It features an expansive glass area. A sliding patio door can also come styled like a French door with numerous lites but it is usually fitted with unobstructed glass panels that not only frame outdoor views nicely but also let in a lot of natural light to support daylighting efforts. Daylighting not only helps make a home more inviting but also aids in reducing dependence on natural light. ● It is energy-efficient. When closed, a sliding patio doors forms an airtight seal around its frames, helping improve insulation in the home. The more insulated a home is, the more it enjoys stable indoor temperature, which keeps cooling needs down. This means your cooling system doesn’t have to work overtime to keep you comfortable so it doesn’t guzzle energy needlessly, keeping energy costs down for you. ● It has a large opening in relation to space it takes up. Depending on how it is configured, a sliding patio door may have one or both its panels operable. When both panels can be opened, a sliding patio door creates a wide opening that makes accessing indoor and outdoor spaces a breeze. But because it tucks into itself, a sliding patio door calls for very little space to operate. ● It has a streamlined design. A sliding patio door’s streamlined design is simple and straightforward, which makes it suitable for a wide variety of home styles. Whether your home is more traditionally styled or sporting a highly modern theme, it will definitely find a complement in a sliding patio door. ● It is easy to use. Because most of the weight of its door panels are carried by the wheels on the bottom rail, sliding patio doors are easy to open and close. Even children won’t have trouble using one! Just give it a light push and a sliding patio door will open and close without difficulty, especially if the rollers are in good condition. ● It is easy to maintain. A sliding patio door is fairly easy to maintain, needing only regular cleaning and oiling to keep its rollers free from dirt and debris and operating smoothly. Its glass panels are also quick to clean, just calling for a thorough wipe down to stay in pristine condition. 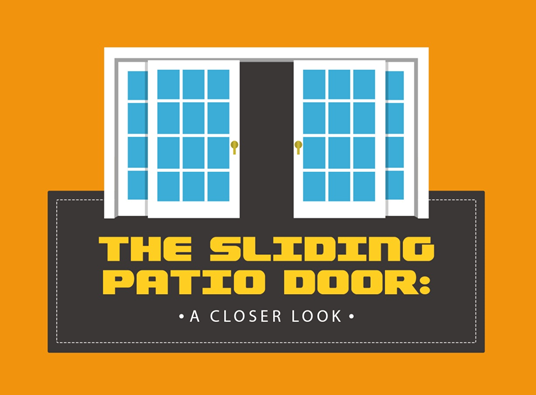 To understand better why a sliding patio door has so much going for it, it pays to know more about its parts. ● Head – The top edge of the door’s frame. Unlike in hinged doors, the entire width of the panel of a sliding patio door is in full contact with the head. ● Jamb – The vertical edges of the door’s frame. Combined with the head and good weatherstripping, the jamb lets a sliding patio door offer plenty of good insulation. ● Sill – The bottom part of the door’s frame. Unlike the jamb and head, this is where most of the sliding patio door’s mechanisms are found as it houses the door’s rails and rollers. ● Rails – A channel (usually made of metal) designed to keep the patio door’s panels properly aligned whenever they are moving open or shut. This is where the rollers go. Sometimes, the top part of the door has its own rail as well. 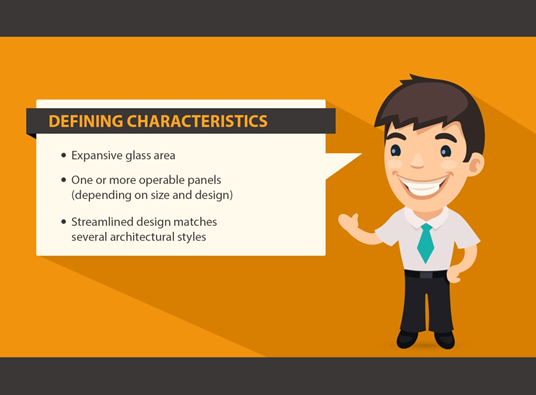 ● Glass – This is what gives the sliding patio door a large viewing area. Today’s sliding doors can have low-emissivity multi-pane glass for better energy efficiency. ● Rollers – A series of wheels attached at the bottom edge of the door’s panels. These rollers eliminate friction, and are the main reason why it’s easy to slide the panels open or shut. Many sliding patio doors also feature rollers on the top edge of the panels. 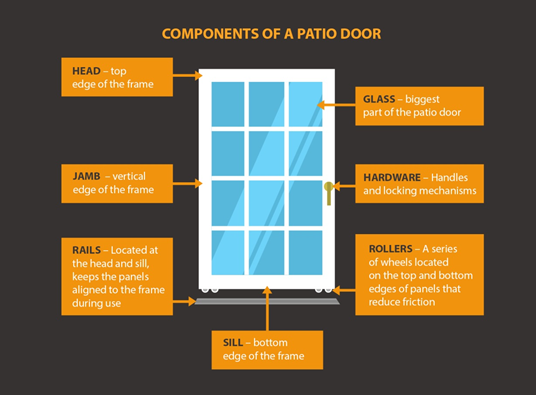 ● Hardware – The handles and locking mechanism of a sliding patio door. They help keep you from smudging the glass every time you need to operate the door. l Your home has a modern theme. Modern homes are all about clean lines, something a sliding door can easily achieve in terms of appearance. Add a sliding patio door with huge glass panels and a slick finish to your modern home and quickly transform it from ordinary to outstanding..
l You have limited space around doorways. Not every home has enough space for hinged patio doors but that’s no reason to be bummed. A sliding patio door can address space constraints, giving you no reason not to invest in a new patio door just because you’re short on doorway space. 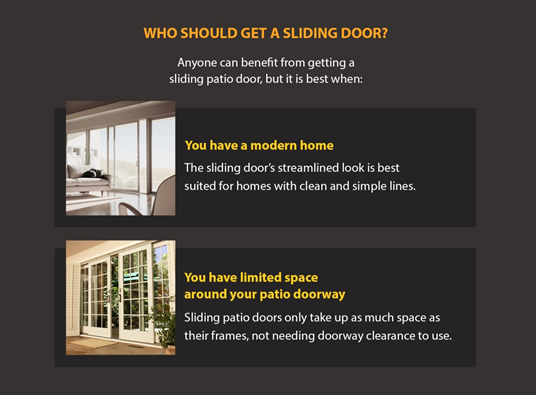 Sold on getting a sliding patio door? It has a number of things to offer but make sure you work only with a reputable patio door expert in your area to ensure you make the most of your investment..
Mark Chaikin was literally born into the window replacement industry, as his dad started a window replacement company (then called My Window Place) in the basement of the family’s home in Baltimore. He joined the business in 1974 and has not looked back since, always putting customers’ needs first. For updates from Mark, check out the Renewal by Andersen of Northern Virginia-DC’s blog!